2015 Road Trip Photos #26: Ornate for the Divine « Midlife Crisis Crossover! 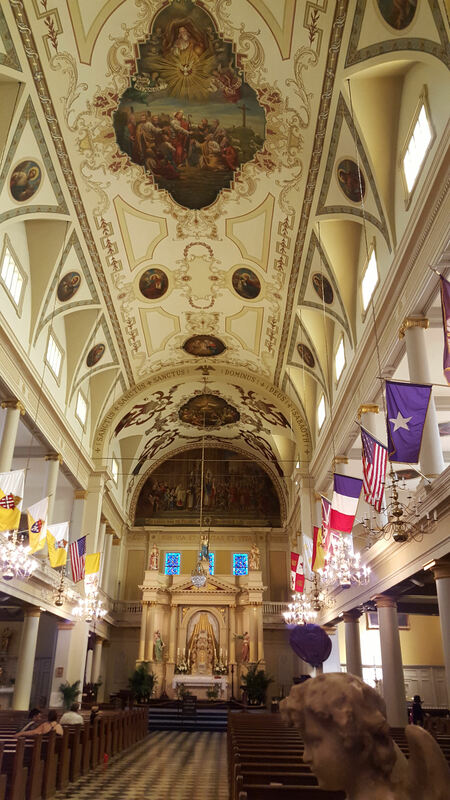 On the morning of our second full day in New Orleans, one of our first stops was St. Louis Cathedral. The majority of the structure dates back to 1850, with minute portions integrated from still older predecessors. It’s the centerpiece of Jackson Square (as you’ll notice in the preceding chapter), free for tourists to visit (donations are suggested), serves an active congregation, and remains the seat of the Roman Catholic Archdiocese of New Orleans. We took several more photos of the Cathedral, but upon seeing something so vast and ornate inspired by love of God, I knew at the moment I took this photo that it would command a separate entry of its own. Consider this a teaser for a more extensive Cathedral gallery later this week.